Sematan, a quiet lit tle sleepy seaside town, approx 127km (about one and a half hours driving) from Kuching is set against the backdrop of the picturesque Gunong Gading, with beautiful beaches and vast countryside. The Sematan town is an old idyllic wooden bazaar by the sea with white sandy beaches. It started as a Chinese trading outpost of four families near the Cape of Tanjung Dato adjacent to the West Kalimantan coastal town of Paloh. Today there are 100-strong Chinese community in Sematan. Thi s little town prosper during the 1950s when the British colonial governmen t set up a bauxite mine in 1958. 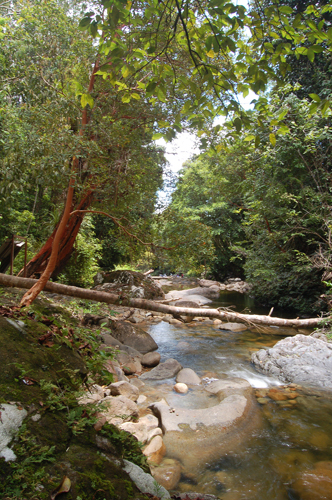 During the Confrontation period, Sematan became an outpost of British Gurkha soldiers looking for Indonesian invaders from across the border. 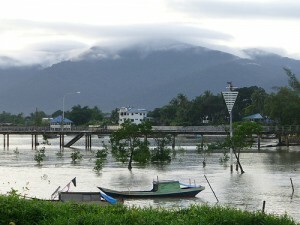 The long stretch of beach north of the town is a popular weekend getaway and picnic spot for residents of Kuching. Sematan faces the South China Sea and is a great place for boat fishing, snorkelling or diving at Talang-Talang Island to see turtles, or visit the World War II Japaneses ship wreck. Holiday Chalet This resort is as expensive as Palm Beach but the facilities and services are not as good. Palm Beach Resort- I stayed in the single chalet, sleep 4, has a newly built but small pool. Crab Farm is located at Kampong Trusan Jaya, about 30km from Lundu Town and 120km from Kuching. These crabs reared in the crab pen are mud crab or locally known as “ketam kalok”. Plank walk for visitors has been constructed at the farm to allow easy movement. It is also equipped with facilities such as rest area and electric lighting. Silkworms Farm – is located about 110km from Kuching City, this is the only silk farm in the whole of Malays ia. Over 50 hectares of the farm have been planted with mulberry plants and another 20 hectares housed the production buildings, office staff and workers’ quarters. The production process, although entirely manual, adopts scientific technology to produce a luxurious, sift and quality finishing. Entrance Fee is RM5.00 per person. Sebat Waterfall- just a half-hour bicycle ride from the resort. Along the way, we enjoyed the beautiful village scenery of paddy fields and pepper farms. We also stopped by the watermelon farm nearby to quench our thirst with this juicy fruit. 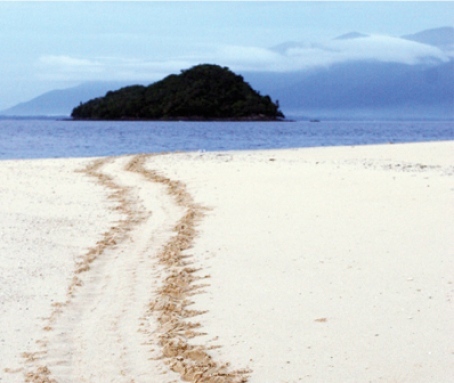 Talang Talang Island The famous giant turtle san ctuary is about 2 hours boat ride from Sematan. 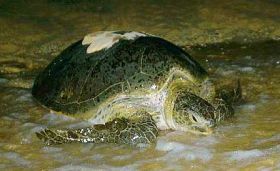 These turtles come to Talang Talang island to lay their eggs. Snorkelling and diving can be arranged for visitors who wish to have a close up view of the undersea world. 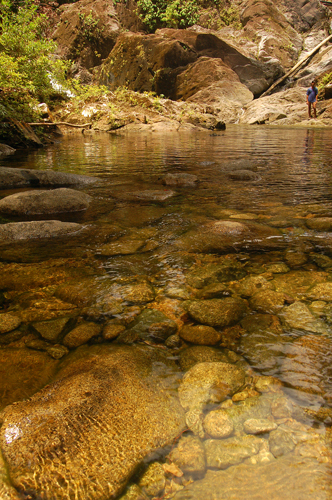 This area has sparkling clear water with corals growing right by the shore at Tanjung Datu National Park. Visitors to Talang-Satang must obtain a permit and pay any fees at the National Parks Booking Office in Kuching. Pulau Satang Besar, the largest of the islands, is open to visitors.